If you’ve enjoyed slideshows in iPhoto or iMovie, you’ll be happy to hear that with the release of OS X 10.4, Apple included a new system-wide slideshow feature. In many places, including the Finder and Preview, you can view full-screen slideshows, complete with a translucent control bar floating below the images (see screenshot below). This is really handy, for instance, if you need to find a particular picture in a large folder of images. Select all the images in the Finder, control-click on the selection, and choose Slideshow from the pop-up menu. One by one the photos will fill your screen. This is a welcome feature, but you’ll find that the controller’s functionality sometimes seems to be far from perfect. It’s often at exactly the wrong spot on the screen, covering a key figure in your chart, for instance. Or maybe you don’t like how long it remains onscreen, or you’d like it to fade away faster (or slower). Thankfully, there are solutions to these issues. Changing the position of the controller is easy if not obvious. To move it, click and hold on a non-button area of the controller—the thin vertical divider lines, for instance—and then just drag to reposition. If you have two monitors, you can even drag the controller onto the other screen, leaving the slideshow screen free of anything other than the image itself. fadingTime controls how long it takes the controller to fade from visible to invisible—set it to 0 to make the panel instantly vanish; set it to 5 to enjoy a drawn out fade away effect. I shortened the delay slightly, settling on 0.5 as a good balance between speed and visual effect. longDelay controls how long the controller stays visible after it’s been used in some way. I found I much prefer it when the panel gets out of my way quickly, so I set this to 2.5.
shortDelay controls how long the controller stays visible after you’ve moved your mouse off of it. Once I’ve moved my mouse away, I don’t need to see the controller for long at all, so I set this one to 1.0. 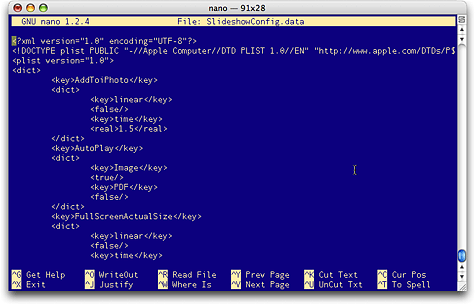 Make changes in nano as you would in any normal word processor—except you move between lines using the arrow keys, not the mouse. Once you’re on a line you want to change, you can use Delete to remove the existing characters (to the left of the cursor) and then just type in your new values. After you’ve made all your changes, hit Control-O (Write Out), then just press Return when prompted for a filename to save the file. Then hit Control-X to exit. You can then re-edit the new data file, and you’ll still have a backup, since the second command above copied the existing backup file.